(CNN) -- A call for Smurfs brought together 1,253 dressed-up-in-blue people in County Monaghan, Ireland. A 4,703-pound cheesecake rolled out in Mexico City. A 7-year-old Michigan boy made a ball of plastic wrap that's 11 feet across. 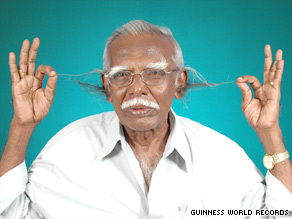 Anthony Victor of India has hair measuring 7.12 inches sprouting from the center of his outer ears. Meanwhile, in Ellensburg, Washington, 13-year-old Brenden Adams is having a hard time fitting into cars. At 7 feet 4.6 inches, Adams -- who as a kindergartner was taller than his teacher -- has made it into the Guinness World Records 2010 book, released Thursday, as the tallest teenage boy. It's a stature he said was earned simply because his 12th chromosome split in half. And while the height has its perks -- "You don't get picked on as much" -- he wishes strangers wouldn't stare. "I'm another person, just like everybody else," said Adams, who doesn't play basketball -- two knee replacements insured that -- and prefers to hang out with friends, camp and ride dirt bikes. From the obscure (Most balloons inflated with a nose? 308) to the old standbys (Lucia Zarate, who died in 1890, still holds the record for lightest adult at 4.7 pounds), it's the reference-book gift that keeps on giving. So why would someone set out to spend the most time in a bumper car (record: 24 hours), or solve the most Rubik's Cubes in one hour (record: 185)? "It's an innate part of our psyche as human beings to explore how far we can push the boundaries," said Claxton, who's been with Guinness World Records since 2000. "We're intrigued by extremes in our daily life" and by "the things we're not familiar with." iReport.com: Follow updates on "Le Grande Bebe"
Jake Lonsway of Bay City, Michigan, was only 6 when high school students in his area set out to assemble the largest group of people wearing Groucho Marx glasses. A snowstorm killed the attempt, but the idea of setting a record became an obsession for the young boy, his mom Julie Grames said. "I told him, 'We'll get a bunch of books, and we'll see if there's anything we can do,' " she said. Building a ball of plastic wrap was where they landed. And what started with a softball-sized ball grew and grew and grew into a 281-pound monstrosity, earning Lonsway, now 9, a spot in this year's record book. Claxton, of Guinness, has seen everything from the innocuous to the extreme and dangerous. He's watched a motorcycle rider crash -- and survive -- trying to outdo the ramp-to-ramp distance jump, just one of the "pushing the envelope" moments that helped him "realize just how out there the world of record breaking can be," he said. Some images might be hard to take in at first. "Over 1,000 piercings in the human body is something you have to get used to looking at," Claxton said. And while the most tattooed man -- 99 percent of his body is covered -- "may not be my cup of tea," he said that when it comes to categories there's something for everyone. Lee Redmond, 68, of Salt Lake City, Utah, earned the top berth for longest fingernails after not cutting them from 1979 onward. As of the last record-setting measurement, her nails were 28-foot long in total, the longest being her left index fingernail that came in at 3-foot, Claxton said. But a car accident in February of this year left her nails broken and her hands much freer, the Guinness spokesman said. iReport.com: World's largest rocking chair? "They were such a part of her," he said, before describing Redmond's attitude as "very stoic," and her take on the broken nails this way: "If something like that had to happen, it had to happen. Someone somewhere had decided enough is enough." This year's book release includes a look at the top 100 records of this century's first decade, Claxton added, as well as beefed up offerings on the Guinness World Records Web site, which is also where wannabe record holders can find out how to compete and get recognized -- if not now, then in the next book's edition. Since the current record-holding Smurfs gathered in Ireland and after the 2010 book went to press, for example, 2,510 ambitious blue ones amassed in a nightclub in Wales. iReport.com: Large gathering of "Waldos"
Does Claxton have his own eyes on a record prize? "I want to spin a quarter for the longest time possible," he said, adding that the current record is 19.34 seconds. "That's the one I want to get." All About Guinness World Records Ltd.